By Blackboard on Jan 9, 2013. As colleges and universities of all types continue to expand their online learning offerings, professional institutions continue to lead the way in adopting the latest technologies to enhance the educational experience. So, we asked some of our cutting-edge professional college and university clients about their journeys into online learning, and what ‘best practices’ and ‘lessons learned’ they uncovered along the way. 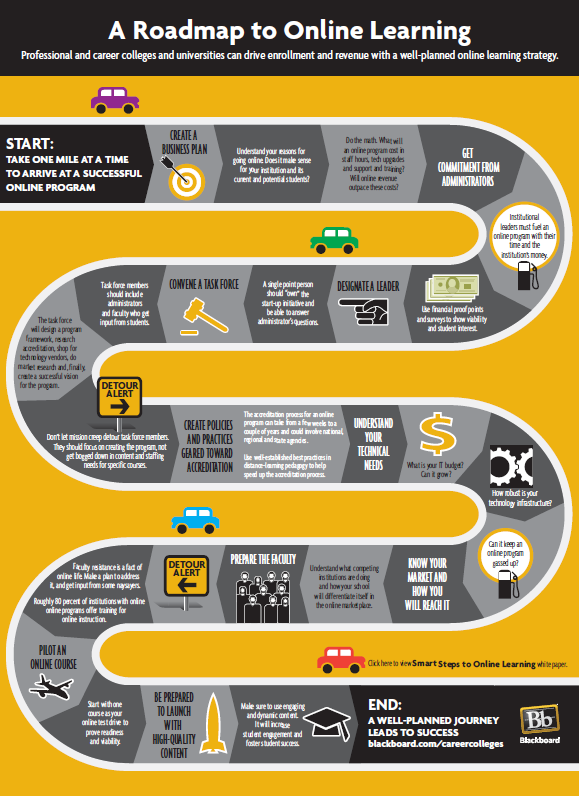 Ultimately, we believe that a well-planned journey is the surest way to reach success in the e-learning environment, and hope this infographic can serve as a guide to any colleges or universities in all stages of online learning development. To see the full infographic click here or view the image below!